The Hague (AFP) - Dutch and international experts probing the MH17 plane crash in eastern Ukraine appealed Monday for witnesses who saw the transport or firing of a BUK surface-to-air missile around the time of the disaster. "Investigators are looking at all scenarios. One of these scenarios is that the plane was shot down at 4:20 pm local time on July 17," the Dutch public prosecutor's office said in a statement. "Given this scenario, investigators are looking for witnesses who can tell more about the transport, crew and launch of a BUK rocket in the area in the days before and after the crash," it said. 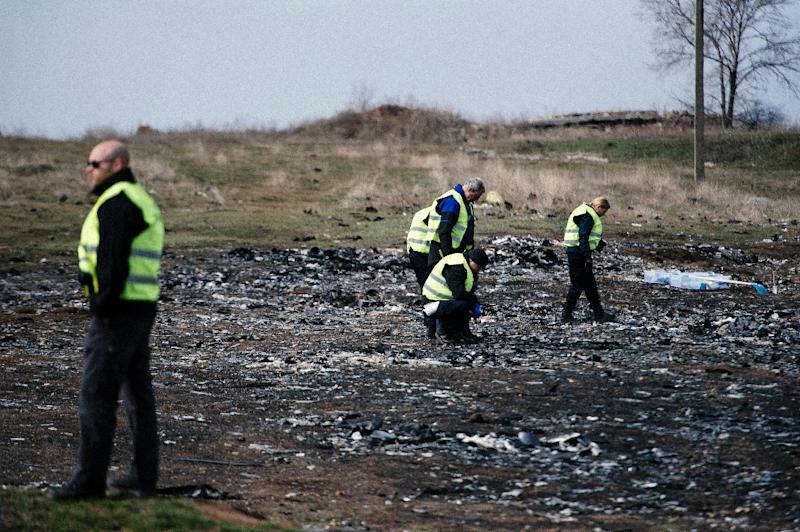 All 298 people on board the Malaysia Airlines jetliner -- the majority of them Dutch -- died when it was shot down over war-torn eastern Ukraine last year. The Netherlands has been charged with leading the investigation into the cause of the incident and identifying the dead. Dutch authorities are also in charge of the criminal investigation into the crash, which occurred at a time of fierce fighting between Ukraine's army and pro-Russian separatists. Kiev and the West have claimed that the Boeing 777 was shot down by the separatists, using a BUK surface-to-air missile supplied by Russia. Moscow denies the charges, pointing the finger at Kiev. Prosecutors stressed "this call for witnesses does not mean there is incontrovertible proof to what caused the crash." "It's too early to draw conclusions on the disaster," they added. The request has been widely circulated via social media and news stations, along with a video in Russian with English subtitles. The video shows images of a lowbed truck-and-trailer transporting the alleged BUK missile system through various locations near where MH17 was shot down, before being allegedly taken back to Russia. It also shows what investigators believed to be a BUK self-propelled missile system driving along a road. The video also plays recorded phonecalls, purportedly between separatists, in which the rebels refer to a BUK system. "We are interested in the specific route the truck drove," the voice on the investigators' video says in Russian, urging any witnesses who may have seen the truck or the rocket system "to inform the Joint Investigation Team." Earlier this month relatives of crash victims viewed parts of the wreckage brought back to the Netherlands, where it is being reconstructed as part of the probe. Two of the 298 victims have yet to be identified.